Sounds like there are some whistles and jeers from a grandstand somewhere. It's been a good half an hour of no running now. Today's tickets won't have been cheap, remember, so I think I'd be a bit unhappy to see no running as well. I'd be unhappy spending that amount of money to attend FP and get a no show. Why no action on friday??? @yashjain: It used to be because of a public holiday, now it's just tradition. Crowd starting to whistle and boo? They've paid a fortune to be there and there's no running. If it's too dangerous - red flag the session. Ricciardo has just put his helmet on and climbed into his car. Is the quiet about to end? There's the unmistakable sound of engines firing up in the pit lane. Could it be? The quiet is about to end, is he going to drive a V8? Another memory from Monaco was being there in 2000 as well, sitting at that time on the hill behind the start/finish line. There was an incident at some point and I remember many drivers running to their pits to get the spare car. We had the chance to have 2 starts. At the times when V10's were turning at around 19,000rpm, it was awesome!!!!! Ted Kravitz did a bit on Monaco on the cheap that is on Sky's F1 website. Pretty affordable looking as long as you have a place to sleep outside Monaco. Alonso for 10th or better. No longer my favourite since he denied Vettel was great. He's still quick though, and on this track he could compensate for the car's lack of pace. How do you think F1 can spice up this sort of session? Bottas the latest driver to pull on the HANS and his helmet. Looks like we'll get some running as we approach the final 10 minutes. Easy, red flag session, stop the timer! Banana skins on F1 tracks. I think we've cracked it. Those whistles turn to cheers as Alonso heads out of the pits on intermediate tyres. Ten minutes 35 seconds left. Looks like the track is still very wet. 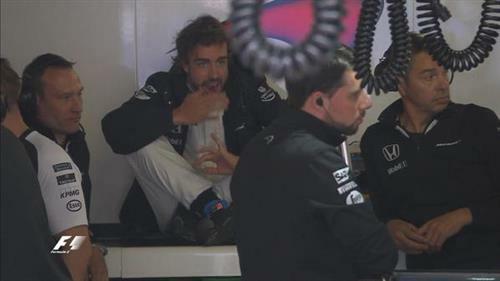 Alonso seems to be taking it easy but still lights up the rears coming out of the tunnel. Looks very, very slippy out there. Alonso carries on to start a timed lap but he's struggling with grip. The Spaniard asked if he's happy to continue and he says yes. Looks like he's working very hard to keep it out of the wall from the on board shots. Ricciardo nearly loses the rear end coming through the final corner. 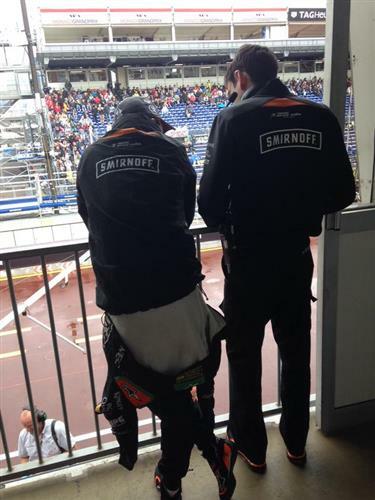 That's why teams were so reluctant to send the drivers out when it was actually raining. This is some tricky driving. Lotus should have brought the Mad Max F1 car and given it a few laps. If Charlie Whiting decides that lack of running is down to a wet track then at a random time during the race for a period of 20 minutes the track will be watered by the equivalent of light continuous rainfall. Maybe do it anyway, that'll make F1 more interesting. Seven cars out on track currently. That's the problem. Why do you want or need artificial gimmicks to spice up the show? There's absolutely NO fun in watching those cars cruising around wet Monaco. Alonso's first flying lap on inters in these conditions a 1:40.401. That's 23 seconds off Hamilton's benchmark from the dry conditions! Those intermediate times are coming down but they are well down on Hamilton's benchmark. @Nate, Am I correct to say that of the current grid, McLaren are the most successful team at Monaco? @AntonyMakanza: Yes, McLaren has won here 15 times. The nearest is Ferrari, with nine wins. Mercedes has sent Rosberg out on the full wet tyre. Button, on the intermediate, says: "Very low grip on this tyre,"
5 of those 15 belonging to Senna!